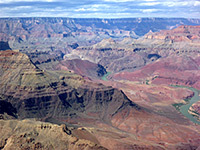 Unlike the North Rim of the Grand Canyon, which has a variety of short paths leading to viewpoints or along the edge of the plateau, almost all trails on the South Rim are long, strenuous and sometimes unmaintained, many descending 4,000 feet or more to the Colorado River. But these all offer fine views after just a short walk of a mile or two, always bearing in mind that the climb back takes about twice as long as the descent. 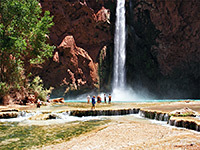 Of the rim to river routes, by far the most popular are the Bright Angel and South Kaibab trails, both leading eventually to Phantom Ranch, where hikers may, if reserving up to a year in advance, stay for one or more nights by the Colorado. Next in order of difficulty are the Tanner and Grandview trails, both fairly well used; all the other paths to the river are unmaintained and for experienced hikers only. Beamer 10 130 One of the few trails that follows the river, the Beamer Trail begins at the lower end of the Tanner Trail and heads north alongside the Colorado, across Palisades Creek, past the Lava Creek Rapids and on to the junction with the Little Colorado River. The first section is near river level, while the second half is along terraces and ledges of Tapeats sandstone, some distance above. Much of this part of the path is quite exposed, narrow, and not particularly well maintained. Boucher 10 4,470 A strenuous but relatively well used route starting 2.7 miles along the Dripping Spring Trail from Hermits Rest, the Boucher Trail is quite level for a while as it traverses the Esplanade sandstone layer, alongside Hermit Creek, beneath Yuma Point and around the upper end of Travertine Canyon, then heads very steeply down Boucher Creek (which has a primitive campsite) to the river. The steepness, exposure and sometimes bad condition of the trail make this the most difficult route to the river on the South Rim. One good loop hike is to combine a descent along the Hermit Trail with an ascent of Boucher - a 2 day trip for most people. Hikers possessing a backcountry hiking permit may drive to the Hermits Rest trailhead, unlike everyone else who need to take the free park shuttle. Bright Angel 9.5 4,550 Bright Angel is a long, steep trail leading to the Colorado River and Phantom Ranch, but the path is well-used, with water at intervals and one campsite (plus ranger station) half way along, at Indian Garden (4.6 miles). This is the most popular of the longer trails in the park, though most people walk only a short distance. Start point is next to Kolb Studio in Grand Canyon Village, near the railway terminus. The trail is shared with mules so is often rather malodorous. Cedar Mountain Flat-topped Cedar Mountain is clearly visible looking east from Desert View, and may be reached by a 4WD track that continues for many miles across rough lands towards the canyon of the Little Colorado River. The first couple of miles makes for a good day hike, giving good views of Tanner Canyon and the Colorado River, while the road is also used to reach the trailhead for the 13 mile hike to Cape Solitude. Comanche Point 6.2 670 The remote, trailless overlook of Comanche Point is reachable by a long but not difficult hike, initially along a disused 4WD track starting near Desert View. 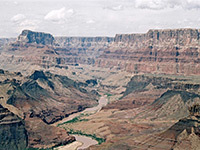 The last section is cross-country, down a shallow ravine and steeply up to the point, which looks out over many miles of the Colorado River; one of the best views on the south (or east) rim. Dripping Spring 3.1 1,400 At Dripping Spring, water drips slowly from a huge overhanging sandstone cliff at the head of a side canyon. The path to the spring combines the first 1.6 miles of the Hermit Trail with a mostly level traverse around the two very deep upper forks of Hermit Creek, and then a short way up the side valley. 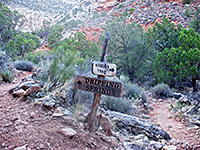 Past the falls, a fainter path continues back up the cliffs to a little-used trailhead on the rim. Escalante Route 12 1,300 The Escalante Route forms a easterly extension of the Tonto Trail, starting and finishing close to the Colorado River but with a middle section that climbs high above, passing over a narrow ridge between Escalante and Cardenas creeks. The west and east ends of the route may be accessed via the New Hance and Tanner trails respectively, forming a total loop of 29 miles (plus 6 miles along the park road). Grandview 3 2,600 This path starts at Grandview Point, descends very steeply, follows a ridge then drops quite sharply again down to Horseshoe Mesa, which has excellent views up and down the Grand Canyon, and is the site of some old copper mines. Grandview Trail then meets the Tonto Trail, allowing for continuation hikes east or west, though unlike most long-distance routes that descend from the South Rim, the Grandview Trail does not reach the Colorado River. The mesa has several sites for primitive camping. Hance Creek 8.5 4,860 A route rather than a path; the lower section of Hance Creek forms a deep, twisting canyon through the Tapeats sandstone then the Vishnu schist, forming many pools, cascades and waterfalls, and may be followed by a strenous off-trail hike, ending at Sockdolager Rapids on the Colorado River. 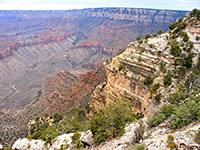 Three places require climbing high above the canyon floor to pass obstacles, traversing steep and unstable slopes. Access is via the Grandview Trail then a short section of the Tonto Trail. Hermit 9 4,340 A mostly unmaintained but popular hike from Hermits Rest at the end of the West Rim Drive, the Hermit Trail winds steeply down the cliffs on the east side of Hermit Creek, then, after a short section of the Tonto Trail, continues descending to the Colorado. The round trip can be done by experienced hikers in one long day, but for overnight trips, backcountry camping is available either beside the Colorado or at the Hermit Creek campsite, about 1.5 miles from the river. Mimbreno, Mescalero, Jicarilla and Piute Points 15 (loop) 400 Peaceful, off-trail loop hike across the flat, forested rim west of Hermits Rest to four remote promontories, reached by unpaved road FR 328; features in view include four isolated mesas (the temples of Vesta, Diana, Pollux and Castor), and six major ravines. New Hance 8 4,530 Also known as Red Canyon Trail, this is a lesser used path that starts from an unmarked trailhead on the rim half a mile southwest of Moran Point, and descends gradually down colorful Red Canyon to the Colorado. The route was constructed by a miner (John Hance) in the 1880s, to replace an older trail in this area, down Hance Creek. New Hance is a difficult hike - vying with the Boucher Trail to be the most strenuous on the South Rim - but still one that can be done as a round trip in one day. Plateau Point 1.5 80 Forking off the Bright Angel Trail at the north side of Indian Garden, this nearly level route crosses the Tonto Bench to a viewpoint at the edge of the inner canyon gorge, 1,300 feet above the Colorado River. The point is 6.3 miles from the Bright Angel trailhead, and so reachable on a day hike. level The Rim Trail links Mather Point with Hermits Rest, following right next to the canyon edge, and so usually close to the road as well. 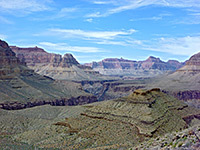 The easiest section is paved, around Grand Canyon Village, though all the path is quite level and not at all difficult. The free canyon shuttles can be used to jump to specific points along the way. The most popular section is probably between Yavapai Point and Grand Canyon Village, overlooking the course of the Bright Angel Trail, though for solitude the nicest stretch is either side of Pima Point. Shoshone Point 1 level One of the least-visited of the named overlooks of the South Rim, Shoshone Point may be reached by an unpaved forest road though vehicular access requires special permission from the NPS. The road is open without restrictions for hikers, who reach the rim after a gentle 20 minute stroll through airy woodland of ponderosa pines. South Bass 7.8 4,400 South Bass is an unmaintained but good condition and easy-to-follow trail to the Colorado River, beginning near Pasture Point, only 12 miles west of Hermits Rest, at the end of the West Rim Drive, but requiring a journey on sometimes rough roads of over 30 miles to the trailhead - partly across the Havasupai Reservation; in theory an extra fee is necessary to cross the short section of tribal land though there is usually no-one to collect it. 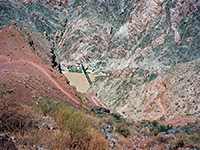 The route begins along Rowe Well Road, near Grand Canyon Village. 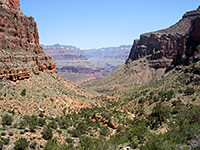 The trail has several junctions with other paths leading east and west along this very remote section of the canyon. South Kaibab 6.5 4,820 Another busy but strenuous rim to river route, with no water along the way, the South Kaibab Trail runs for much of its length along a narrow ridge, so views in all directions are quite unobstructed. This is the best (and shortest) trail for an all day, round trip hike to the Colorado River - but for fit hikers only; it involves the greatest elevation change of any south rim route. The path begins near Yaki Point, a location only reachable by the park shuttlebus. Tanner 9 4,600 Unmaintained, very steep near the start, and lacking any water, the Tanner Trail starts at Lipan Point, descends a side canyon, passes around two large mesas (Escalante and Cardenas buttes), drops steeply again through the Redwall layer around Tanner Canyon then becomes more moderate, passing through open, undulating land to the Colorado River. level By far the longest trail in Grand Canyon National Park, Tonto begins at the lower end of the New Hance Trail in the east and follows the gorge all the way to Garnet Canyon near Pasture Point in the west, along a bench at a fairly constant elevation of 3,000 feet - mostly over the Tapeats sandstone component of the Tonto group. 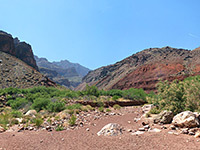 Few people walk the entire route, but Tonto intersects many other paths allowing for hikes along certain sections; the main junctions are with the South Bass, Boucher, Hermit, Bright Angel, South Kaibab, Grandview and New Hance trails. The Tonto Trail winds in and out of many tributary canyons, and its 92 miles equates to less than 40 miles along the river. Waldron 2 980 The Waldron Trail is a short connecting route from a forest road on the rim, south of Hermits Rest, to the Hermit/Dripping Spring trails. The gradient is gentle at the start and finish, with just one steepish section in the middle, through the Coconino and Toroweap layers.